The Park is located in Laden-La road and right opposite to the State Bank of India building. It's a short distance from the base of Nehru Road and few yards from the Clock Tower. 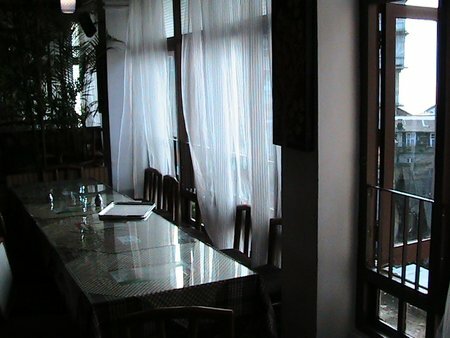 The restaurant is located on the upper floor of a two storied building. Established in the year 1993, the Park restaurant has created its own name for its great Thai cuisine as well as Indian & Chinese dishes. The restaurant is owned by Deep, an entertaining local who is always dressed up like a cowboy and wearing a wide-brimmed hat. From the road, you will need to climb a few stairs to reach to the restaurant. Right across the entrance, there is a large counter and an impressive well stocked bar. Deep would usually manage the counter full time unless he has to be out for some other work. There is a separate bartender who manages the bar area. The dining room is quite spacious and large. The glass topped tables are arranged in rows. There is a large wall-to-wall mirror at the end. The window side tables on the right have good views. Update October 2014: There is no longer views available because of a large construction behind the restaurant. Every time we came to this restaurant earlier for lunch, my wife would choose one of the window-side tables to get the great mountain views. But that's now gone. To add to the decor, there are many plants on pots that have been kept near the tables and around the large pillars giving it a garden like setting. There are large LCD wall televisions that have been added during the 2011 Cricket World Cup Matches. Deep also makes some strange collections that can also be seen in the restaurant. When you walk in, just on the right of the entrance door there is a huge figure of a monster that is made of scrap metal. You will also see a number of horses heads hanging from the walls that have been collected from Cambodia and are made out of wood. Over all the ambience in the restaurant is pleasing and friendly. Deep the owner was born and brought up in Darjeeling and did his graduation from the North Point St. Joseph's College. He initially worked for in a casino in Katmandu and was deeply involved in music. Later he settled down with this restaurant in Darjeeling. There is a small private room facing the Laden-La road where a small group can dine in privacy. The room is mostly occupied by the young locals. Smoking is allowed only in that private room. Coming to food, you can try any of the Indian or the Chinese items. But the signature dishes here are from the Thai cuisine. 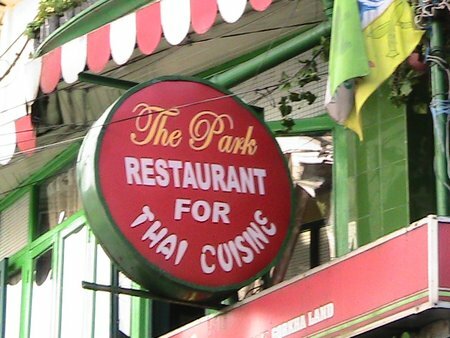 The Park actually specializes in Thai dishes. When I once asked Deep why he chose Thai as the main cuisine, he said that "Thai dishes have a bit of everything like spices, hot & sour taste, nice herbs etc etc. So once you get used to Thai dishes, Chinese would taste quite bland". Tom Yam soup which is a hot & sour Thai soup. The broth is made out of fresh ingredients like fish sauce, flavored herbs, lemon grass, lime juice, chili pepper etc. It has pieces of fish and prawns in it. Note that Tom Yam also known as Tom Yum soup has been ranked as number 8 in World's 50 Most Delicious Foods as listed by CNN Go in 2011. The Red Curry which is prepared out of dry shrimp paste. If you like hot spicy dishes, then try out my favorite Som Thum. This is a Thai salad with green papaya. Keep a bottle of water with you. It's really spicy. There are many other great dishes offered by the restaurant. Thai Sweetae noodles look like normal noodles but the process of preparation is quite different and the taste is different too. There are several other nice Thai dishes like lemon fish, garlic fish etc. In Chinese you can go for Chili prawn, Chicken with sweet basil, or even the usual chili chicken that are really prepared well. Another great dish to try here is the stir fried veg with chicken. You will also get all the regular Chinese dishes including many different soups, fried rice and chowmeins. 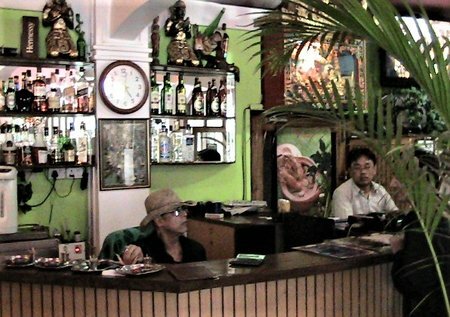 The bar is well stocked with both Indian and foreign spirits and beers. They also have selections of wine. The counter and the Bar at Park. Every time I have been to the Park restaurant, I have found the service to be quite nice and quick. The owner being there all the time does seem to make a big difference. The waiters are friendly and all speak good English. And all the dishes are prepared fresh, they are tasty and come at very reasonable prices. So overall, The Park Restaurant offers a great value for money and has always been in my list of favorites. Starts at 10am and the last order is taken at 9pm. The restaurant closes by 10pm. The Park serves lunch & dinner. They accept credit cards. 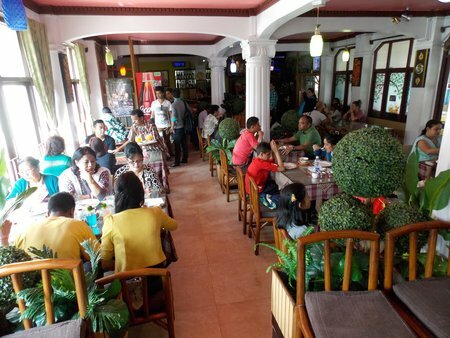 The Park Restaurant is located on Laden-La Road and right opposite to the State Bank of India building. If you are coming down from the Chowrasta Mall along Nehru Road, from the base where Keventer's and the Police point are located, it's less than a minute's walk and will be on your right on the Laden-La road. 41, Laden-La Road, Darjeeling, India.